Winner Update Where's My Tote? Stacey from Poofing the Pillows! This ice cream treat started with a gift of homegrown peaches and produce from my sister-in-law. She, along with her husband grow a vegetable garden every summer. 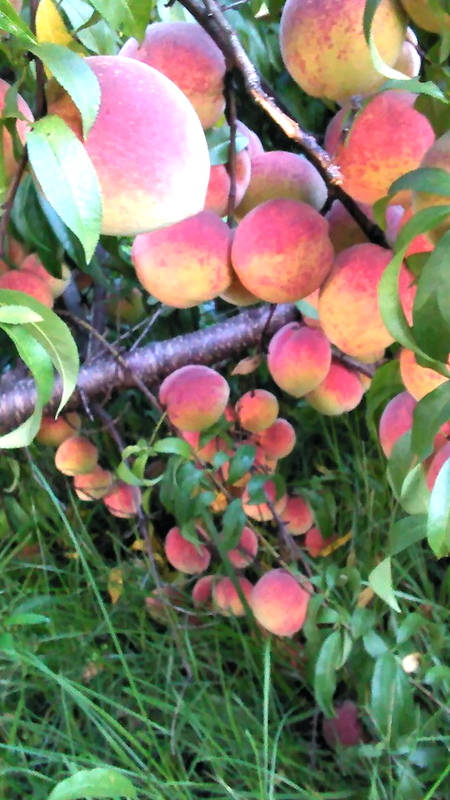 Alongside the garden are eight peach trees which produced a bountiful crop this year! I decided to use some of the peaches in a pretty bowl for a centerpiece on the island while they ripen a little longer and with the remaining peaches I made ice cream for my ice cream loving husband. His favorite flavor, peach! The reason being, he grew up in the middle of "peach country." 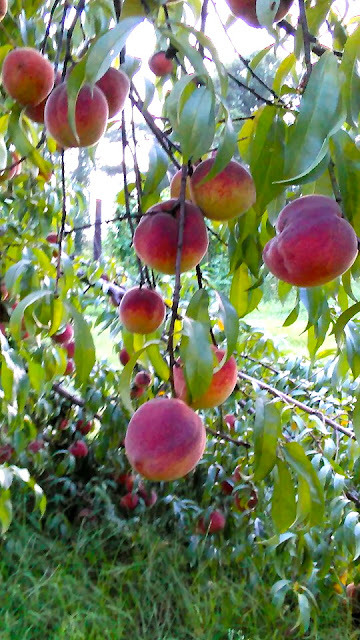 Who says the best peaches are grown in Georgia, we have our own "peach country" right here in central Alabama! The recipe I use is at the end of this post. Sorry, I had sticky peachy fingers and missed photographing a few steps. I'm using the basic Cuisinart peach ice cream recipe. I adjusted the recipe by cooking peaches and adding peach syrup. 2. Add 1 cup water and 1 cup sugar to saucepan, heat, stir until sugar is dissolved. Add peaches. Cook on medium heat until liquid is reduced to about 1/2 cup and peaches soft. Drain peaches and save peach syrup, cool. I used my 2 quart Cuisinart ice cream maker preparing it the night before by putting the removable core (tub) into the freezer. I also mix my recipe the night before and chill in frig, everything cold makes the machine more efficient. After about 40 minutes your ice cream starts to freeze to a soft consistency. It can be served at this point but I like to pour into an airtight container and put into the freezer. Let sit overnight for a harder cream. I use a small ice cream scoop for dishing up. Add sliced peaches for a dreamy desert or treat. I am using a Juliska plate and bowl to serve. 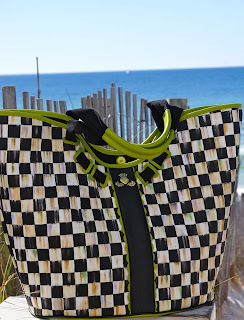 You get a sneak peek at my latest favorite china pattern! Found a few pieces on sale, more on this later. Summer sweet peaches just don't get any fresher, thank you Holly! Try my ice cream recipe or your own but peaches will soon be out of season, get yours before they are gone. Chop peaches. Add water to saucepan with sugar, heat until sugar dissolves. Add peaches and reduce heat to simmer until liquid is reduced to about 1/2 cup. Cool. Mash peaches with a fork. In bowl combine milk, cream, sugar, salt and vanilla. Use a hand wisk or mixer and stir until well blended. Slowly add syrup and mashed peaches. I store in airtight container overnight in frig and make the ice cream the next day. My husband says it is delicious! Thanks for stopping by, I love your visits and reading your comments, it's the only way I know you stopped in. Yum, Yum, Yum!!! The Morgan's love homemade peach ice cream! Your ice cream looks fabulous and what a neat compote. I look forward to hearing more about your new china. It is beautiful! 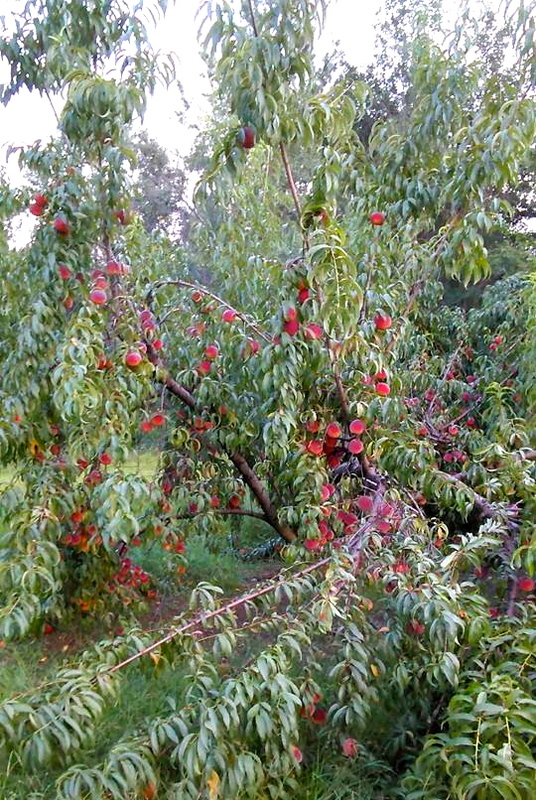 The peach trees laden with fruit look so pretty. It must be very rewarding to have a good crop. Well, if that isn't summer on a plate, I don't know what is! It would be wonderful to have peach trees that are as prolific as these. How nice that she shared so many with you, and they definitely make a lovely centerpiece Emily. Is there anything better than peach ice cream for a hot Alabama summer's day? I don't think so! Your recipe sounds divine! Love the Juliska plate. It's such a pretty pattern. And, of course, big fan of peaches and ice cream, too. That looks absolutely delicious, Emily! 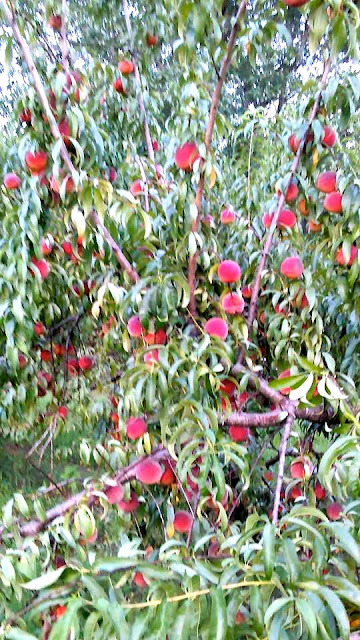 I have seen two other friends' peach trees this year look as heavily laden with fruit as your sister's - one in AL, the other right here in WV. In both cases, the branches actually broke before the peaches could be harvested. I love peaches! How sweet of your SIL to share the bounty of peaches, Emily! I know your peach-loving hubby enjoyed your home ice cream. The recipe sounds heavenly and you served it in such style. Oh my goodness - that looks scrumptious! The tree full of peaches had me longing for some juicy fresh peaches. The don't grow well on the the Island, so we wait for the grocer to get them from the Okanagan or the southern USA. Those photos have, I'm sure, made all of us hungry! Oh those beautiful peaches and my fav ice cream! Makes my mouth water - beautiful photos! 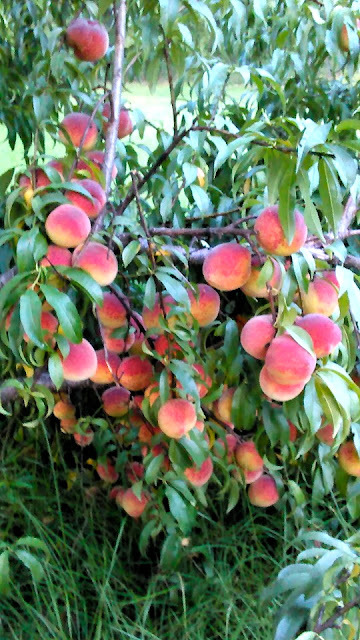 Imagine being able to walk into your own garden and pick fresh ripe peaches to enjoy. Peaches and ice cream is one of our favourite summer puddings too but sadly I have to buy my peaches at the market. So happy to see you joining us for MM this week and thank you for sharing your recipe with us. You made my mouth water! Peach season is over where I live and I'm going to miss them. Have a great week! This looks absolutely delicious! I don't have one of these machines, but I do have a little Donvier that you have to turn the handle by hand. I am going to try this cutting down the proportions to what I think will fit. Or -- taking a leaf from your book, I could probably mix the whole batch and freeze it incrementally in my little gadget. I do love some fresh peach ice cream, and I haven't had any this summer! You have served it so beautifully, too; your new Juliska is gorgeous! Emily, the Texas peaches are finished for the season, but we do love our peaches. I'll save off the recipe for next summer. Your sister-in-law has a beautiful orchard. The ice cream looks so refreshing. We would be in heaven. Susan and John were here overnight. I made chocolate chip cookies to have with ice cream and chocolate cherry sauce. Good, but not as tempting as fresh peach ice cream. Peaches are such a wonderful summer fruit. Your peach ice cream looks delicious. I usually make some, too, but haven't yet this summer. Your post is inspiring me. I'm so excited about the MacKenzie Childs soap!! Did I tell you that I got to go to their place in Upstate New York last year? It was gorgeous. Thank you ever so much. Hi Emily! OH, Lord, I'm dying here - I love peaches and I love home made ice cream! Yummy. Thank you so much for popping in to see me and I hope you and your family are doing well. Very interested in your ice cream freezer. My old-style freezer broke a few years ago and I need to replace it. I'm a plain vanilla lover, but my family is crazy about peach ice cream, so I'll have to use your recipe. 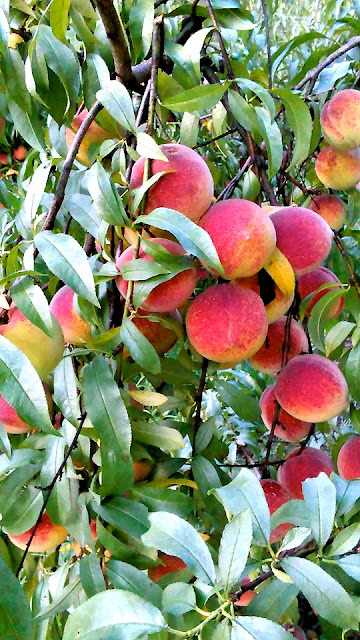 Your photos of the peaches are beautiful. I am impressed Emily that you have peach trees and make your own peaches and ice cream. My Dad loved ice cream so we had it about every night when I was growing up. I would love to taste your fresh peaches and ice cream. Great pics. Emily, your photos of the peaches are beautiful! 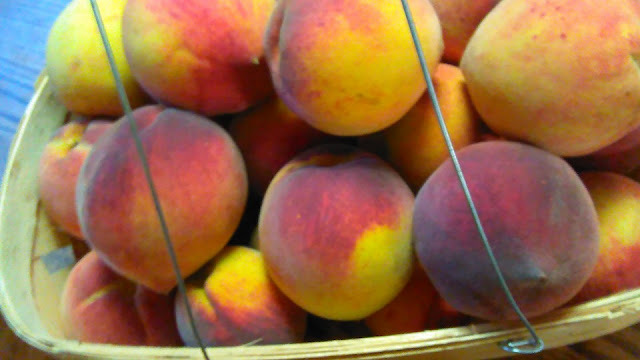 We get our peaches from Pennsylvania and they are wonderful. I think it's time for some peach cobbler :-) Your ice cream sounds wonderful! Congrats to Stacey on the win. Peach ice cream is always a summer favorite and your recipe sounds especially delicious! Don't you just love the color? It's so pretty! Country Estate is one of my favorite patterns too. Lucky you to find some on sale! Peach ice cream is a summer time favorite and your recipe sounds so delicious! Don't you just love the color of peach scream? It's so pretty! Country Estate is a favorite pattern of mine too. Lucky you that you found some on sale! Oh my word- ok this is the second peach post I have read and I haven't had a peach once this year - I absolutely must get some peaches. 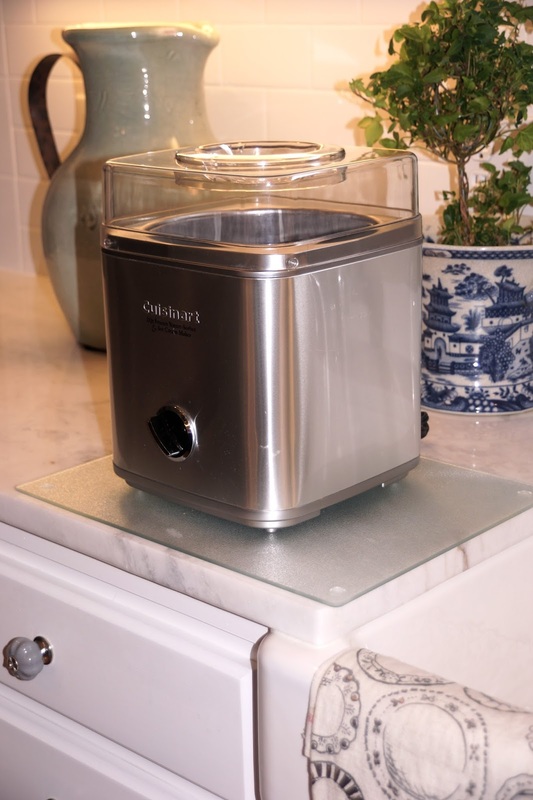 We have that same ice cream maker - and we need to make peach ice cream too. You have inspired me, thank you sooooo much! HUGS!! Emily, you're making my mouth water. That looks so good. I've been considering buying the ice cream attachment for my Kitchenaid. These photos might push me into that splurge. Of course I don't have a sister to bring me fresh peaches. Lucky you! Giving you a feature today for "Let's Talk Vintage!" Thanks so much for linking up! Lucky you to have fresh peaches and a sweet sister that brings them to you! Love this luscious and beautiful Summer treat! Also wanted to let you know that you will be featured this week at Thoughts Of Home On Thursday. This brings back memories of my youth - We had peach trees and every fall my mom would make peach jam, peach pies, peach and apple sauce, and so on, BUT never peach ice cream. It looks so refreshing and tasty!! Peach ice cream. Heaven. Big sigh. I'm still craving some of that peach ice cream, Emily! Thank you so much for popping in to see me. Thank you for your kind words, Emily. Always a pleasure staying in with you throughout the years. I've stopped by a couple of times this summer ...quietly. Catching up on your tote travels and trying to figure out how to install my old music player (like yours below) on WordPress. Emily, this looks so good! I don't think we have made ice cream, since the girls left for college. I think that's about to change!